As we get older in life, we begin to run out of “firsts”. Early in life, there are so many firsts….first kiss, first love, first car, first road trip, first house, first job, first successful homemade meal for others. The first meal I made my husband when we met was horrible. I made him Chicken Helper but used ground beef and I think there was some freezer-burned shrimp thrown in for good measure. *Shudder* The chick-beef-shrimp-arole was barf-worthy. I think the poor boy choked it down…with a smile. What a man. Lucky for both of us, I have come a long way from the mystery meat boxed meal days. 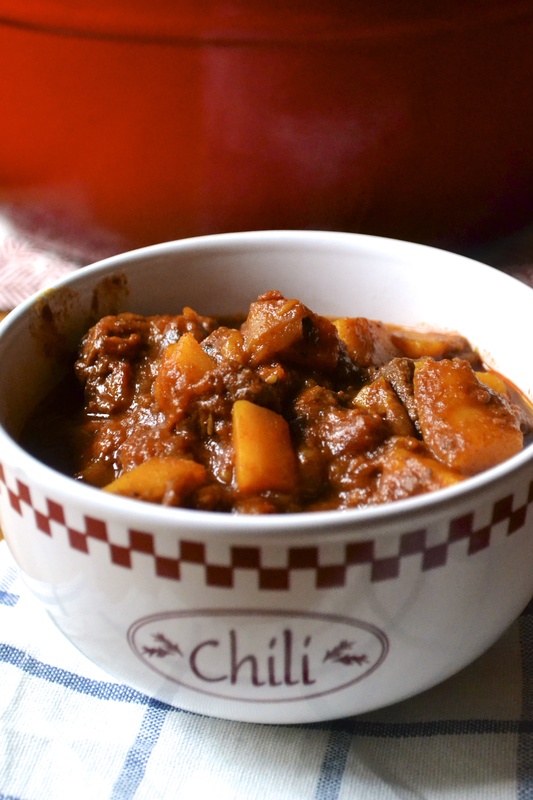 Last weekend I made a chili…a chili that was a “first” for me. Now, I have a pretty kickass chili recipe that I normally make. But I wing it every time. I’ve been making it for years and we love it. However, I saw a delicious brisket style chili in Bon Appetit and I wanted to give it a go. So this chili was the first time that I have ever followed an actual recipe for chili. The first time I have ever made a chili WITHOUT beans! gasp. The first time that I have added winter squash to chili. The first time that I cooked a chili in the oven..say whaaat??? AND the first time that I have made chili without ground beef (with exceptions of vegetarian chili and white chicken chili)! *Drumroll* And ladies and gents, I gotta tell ya….that although I totally heart my old standby “throw some beans + tomatoes + ground beef + hoooooopla of chili powder” method of making chili…this chili is OUTSTANDING. Yes…caps are necessary. I will have a hard time making another type of chili now. It’s changed my life. The original Bon Appetit recipe called for 5 pounds of beef brisket…yes FIVE. I cut that down to accommodate the 2.5 lb arm roast that I had from my CSA (community supported agriculture) stash. I cut the thawed roast into 1/2-inch to 1-inch portions. Simmered low and slow in my dutch oven in a 350F oven for 3 to 4 hours. The roasted beef chunks just fell apart. Butternut squash is added during the last hour of cooking. It adds a great chunkiness and heartiness to the dish. And don’t forget the chili powder….like 1/4 cup of chili powder. 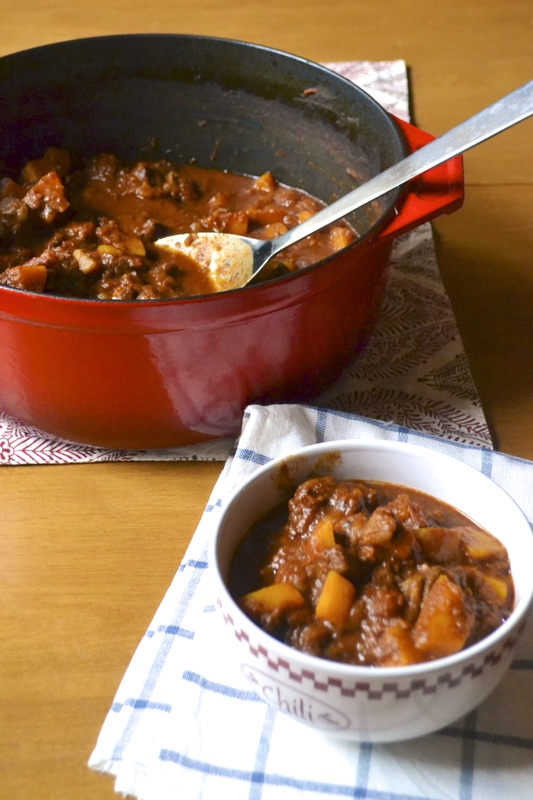 Recipes that only call for 1 tablespoon make me laugh…THAT AIN’T CHILI! That’s northerners attempt at spicing up marinara sauce, I think. Well, in my personal (and correct) opinion. No offense, northerners. Ya’ll make a lot of things right…but chili (and biscuits and gravy) ain’t it. Last weekend, I made this chili on a cold and rainy day when OU beat the crap out of Texas. SO it was only fitting that we ate Beevo for dinner. Mmmm. So I call this the Beat Texas-Style Chili…and beat them we did. Sprinkle diced beef all over with coarse salt and pepper. Set aside. Sauté bacon in heavy large ovenproof pot (dutch oven is perfect for this) over medium-high heat until the bacon begins to brown. Reduce heat to medium and add the onions. Cook until tender, about 5 minutes. Add diced beef and garlic to pot and stir to coat with bacon and onions. Allow to brown on outside. To pot, add water, chili powder, cumin, oregano, and 1 1/2 teaspoons coarse salt. Add tomatoes with juices, green chiles, and tomato sauce. Stir to coat evenly.Bring chili to simmer. Cover and place in oven. Cook for at least 2 hours. Remove from oven. Spoon off grease from top if any. Add squash and stir to coat. Add additional water if the chili is really thick (about 1/2 cup to 1 cup), keeping the meat covered. Place the pot back into the oven, uncovered. Roast uncovered until beef and squash are tender, about 45 minutes longer. Remove from oven when beef is tender. If it isn’t, put it back into the oven for a little longer. When the beef is tender, spoon off any fat or grease from the top of the chili. Season chili to taste with salt and pepper. Stir in diced cilantro or serve it as a topping. Great post Alissa! WOW!!! I guess I will HAVE to make this and soon. That looks so rich! 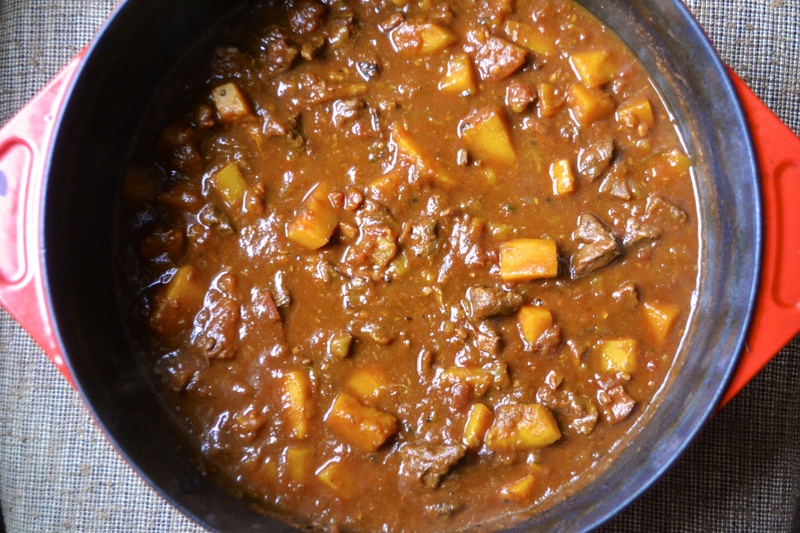 Butternut squash is so, so good in chili too. Glad I’m not the only one that makes chili by throwing a bunch of stuff into a pot, but I think you may have convinced me to use a recipe (and a lot more chili powder next time). this is beautiful! the addition of butternut squash is genius. it just looks so comforting during this cooling season. i remember the early dishes i used to whip up, trying to use up ingredients that i had on hand, being creative and failing miserably. it’s good to be able to look back & laugh! it’s even better to realize how far you’ve come since then. So true! The key is good ingredients.